Thank you, As always, HSN Does it AGAIN!!! He bought what he wanted me to have I guess? Pure One filters have considerably more filter media in them that may restrict oil flow in a smaller motorcycle engine verses a larger, say, V6 or V8 automobile engine. MORE media means greater flow, not less. Also, a smaller engine requires LESS media, not more. That's a fools comment. Both points are false. There is no generalization here. The size of the engine does not necessarily determine the amount of media required and certainly more media does not mean more flow. Last edited by skullcap; 11-12-2014 at 07:34 PM. I found my fitment problem, Wrong filter in the right number box!! I prefer Wix filters, but they can be a bit expensive depending on the model. The O'Reilly Auto parts site, you type in the part number, at the bottom of the page, there is a compatibility tab. If you click on that tab, it will show you different cars that filter is used on. For example, the Wix 51356 will fit a 93 Ford Probe GT with a V6. So I searched for an oil filter for that car, and was then shown ALL the filters that they sell that are similar. Point is, I can get a house brand (MicroGard, made by Puralator), but has a part number almost identical to the Wix (51356 to MGL51356). 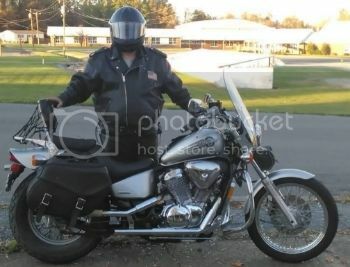 For the record, by bike is a 01 Sabre 1100. I did not find a reference number for a VT750C A (09 Shadow Aero) filter. Could someone help please?